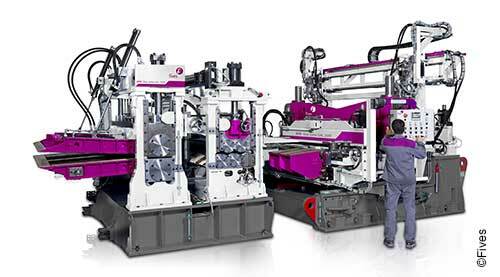 Fives has developed a wide range of machines dedicated to supporting the coil during the decoiling phase and maintaining the correct strip tension. The OTO line of decoilers ranges from simple and small machines like the single mandrel uncoiler to complex and massive pieces of equipment like the double uncoiler for 168mm tube outside diameter and the single mandrel with automatic coil preparation for 508 mm diameter tube mills. Each element of the line is a sturdy piece of equipment that has been conceived to endure the loading and high speed payoff operations of heavy steel coils. Opposing cones types are particularly suitable for use with medium width, large diameter coils since it permits high decoiling speeds. Braking is "reverse current" type. All the components of the decoiler are supported by means of a robust welded steel frame. Two counteracting hubs hold the coil during the unwinding phases. The coil is brought to a vertical position between the two hubs by means of a specially designed trolley. The two hubs approach each other inserting their conical mandrels into the coil until reaching their limit position. At this point the operator can remove the trolley and insert the coil in the line. 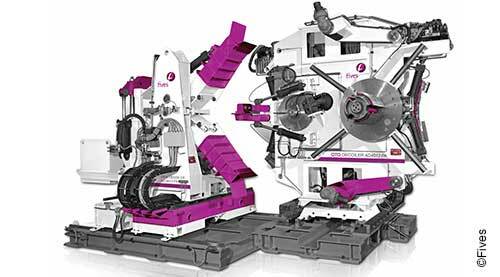 A double decoiler with orbital rotation type minimizes the time between the completion of decoiling of one strip and the joining operation of the next strip, when working with medium-heavy gauge material. This decoiler allows the operator to perform all the necessary operations to detach, guide, and lead in the strip on the new coil without having to suspend the decoiling cycle of the previous coil. The operator is able to prepare the leading end of the strip under the rolls of the triple pinch-roll, and as soon as the trailing end of the coil that has terminated, the decoiling phase is closed in the strip joiner fixed clamp (this operation being performed automatically), he can feed the leading end forward for the joining operation. This is a particularly compact and rugged unit which, following a design stage involving attention to the smallest details and after implementing all the necessary electrical and hydraulic commands, allows the operator to change the coil without being obliged to handle the strip or perform any manual operations within the space of a very narrow time window. With double decoiler series, a lateral bulkhead serves to retain the coil in its vertical position on the mandrel during the high speed decoiling phase, thereby ensuring complete operator safety. The twin mandrel decoiler makes it possible to load the next coil onto the unoccupied mandrel while the other coil is supplying the mill. Braking is achieved with a proportionally controlled pneumatic disk brake. With single decoiler series, a lateral bulkhead serves to retain the narrow coil in its vertical position on the mandrel during the high speed decoiling phase, thereby ensuring complete operator safety. The bulkhead is not necessary with largest coil. Braking is achieved with a proportionally controlled pneumatic disk brake or with electric motor. The mandrel, which is a three expansion segments type with hydraulic cylinder and wedge blocks for segments expansion-collapse, serves to lock and support the coil. The coil is held in a vertical position by means of a spoke-type support. The system of coils unwinding based on stepped opposed decoilers principle is particularly suitable for coils of heavy weight and strips of high thickness, to be used in tube mill lines producing tubes with diameters exceeding 12". This system allows to subdivide the weight of the coil on two decoilers and to reach the necessary counter pull to tension the strip. The stepped opposed decoilers find application in a highly automated loading system consisting of a loading cradle, sampling saddles and eventually a loading beam to handle a sort of a coil stock. Some sophisticated uncoilers have been designed for special applications. The AD 4013 PA that meets the need of automatic entry systems where the operator can completely direct operating sequences from the control desk, is a brilliant example. Allowing the contemporary loading of two coils at all times, the Planetary uncoiler AD408P is a truly unique machine that minimizes the cycle time.